Alumnus is first JA president of Board of Governors. FIGHT ON: Rod Nakamoto gives the traditional USC victory sign as he is installed at the president of USC Alumni Association Board of Governors on May 26. 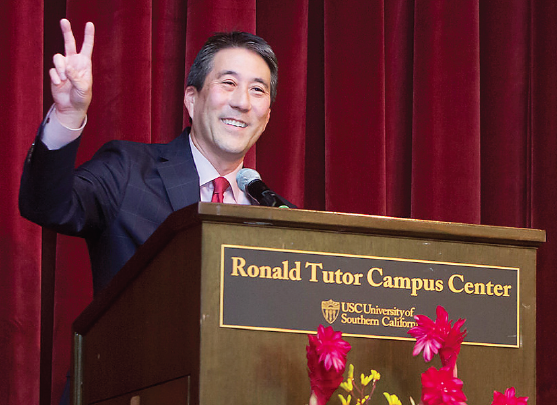 Rod Nakamoto was installed as the president of the USC Alumni Association Board of Governors on May 26, becoming the first Japanese American to lead the organization. 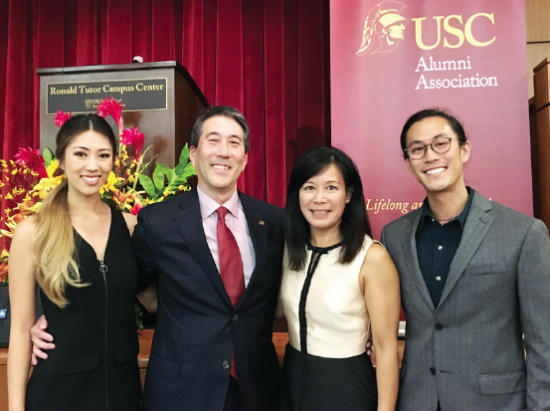 Over the past year, Nakamoto had served as the immediate past president for the USC Asian Pacific Alumni Association after being the president from 2011-2013. He has been a member of the USC Alumni Association Board of Governors for the past six years, and has been extremely dedicated to USC. In 2015, Nakamoto was chosen as the next president-elect of the USC Alumni Association Board of Governors. As a result, this year, he is serving his term as the association’s 93rd president. Nakamoto is a USC graduate who received his bachelor’s and master’s degrees from the Marshall School of Business. He is currently a vice president at J.P. Morgan Securities and has been involved with organizations like Boy Scouts of America, East West Players, Pitzer College, the Asian Business League of Southern California, and the Asian Pacific Community Fund for about two decades. In 2013, the USC Alumni Association recognized Nakamoto by giving him the prestigious President’s Award. His leadership skills and creativity have helped mold the USC Asian Pacific Alumni Association into what it is today. He consistently attended APAA events and helped establish a number of events as well. His APAA volunteers concurred that there were very few people who were more deserving of this award. His work ethic and dedication have earned him the respect that he deserves. Grace Shiba, executive director for the USC Asian Pacific Alumni Association, also had plenty of praise for the new president. “Rod is amazing and has the qualities of the ideal Trojan — faithful, scholarly, skillful, courageous, and ambitious. His love for USC is reflected in everything he does. We are proud of his many accomplishments both professionally and at the university, and salute him as he takes the helm as president of the USC Alumni Association Board of Governors,” she said. Rod Nakamoto with his family (from left) daughter Brynn, wife Elsie, and son Scott. Not pictured: daughter Emily Nakamoto. The first USC Alumni Association was created in 1885 and it lasted for 38 years. The current association was founded in 1923 and its goal is to help USC by engaging all alumni for life, establishing a culture of benevolence among the Trojan family, and by being the voice for all former USC students. The Board of Governors provides vital advice and support in developing and applying the association’s programs and services. In terms of reaching out to alumni, Nakamoto will be leading the board in pivotal signature engagement events such as the USC Alumni Leadership Conference, the USC Day of Scervice, USC SCuppers, USC Day of SCupport, and the USC Alumni Awards. Through these events, he hopes to engage alumni and members of the Trojan family and provide them with benefits and services. It is not an easy job to head the alumni association of one of the best schools in California. However, Nakamoto has more than proven himself as a leader, and is ready to make history as he takes on this new challenge. Will be in Tokyo day of the Alabama game. Do you know of any Alums I can hook-up with?